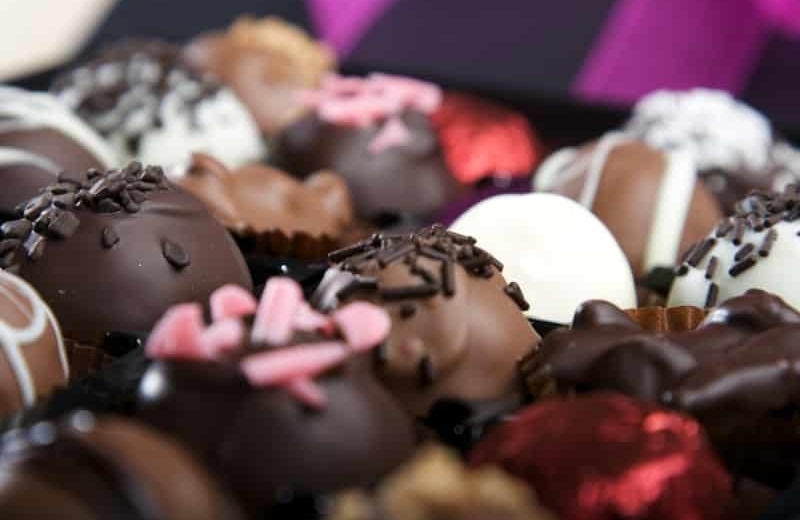 “Les truffes au chocolat”, chocolate truffles, have become synonymous with luxury and decadent indulgence. Whole stores are dedicated to them, yet, they are fairly easy to make. Here is my recipe. 1 – What is “Une truffe au chocolat”? Basically, a chocolate truffle is ganache covered with tempered chocolate. Hum… unless you are already a cook, this may not be super clear!! What is ‘une ganache’ (ga nash)? It’s a mixture of melted chocolate and cream. It’s the soft, silky and creamy inside of the chocolate truffle. It’s chocolate that has been melted to a certain temperature, cooled to a certain temperature, then melted again. It’s the hard covering which provides a crunch as you bite into the chocolate ball. The ‘hard’ part of the chocolate truffles is the ‘hard(er)’ part of the recipe because tempering chocolate can be kind of tricky. But that particular step can be skipped without too much loss in flavor or consistency. This recipe makes about 24 truffles. 6. Using a mini ice cream scoop or two spoons, form the mixture into 1-inch balls and and place on the prepared sheets. 7. Chill until firm, about 10-15 minutes. While the balls are chilling, melt the remaining 6 ounces of chocolate. After it is completely melted, allow to cool slightly before continuing. 8. Place cocoa in small bowl. Remove the balls from the refrigerator. Using one hand, dip the balls into the melted chocolate. Roll it around in your hand, allow the excess to drip back into the bowl. Place the truffle in the cocoa. With your clean hand, cover the truffle with cocoa. May be stored up to one week in an airtight container, and makes a wonderful home made gift ! “Coquilles Saint Jacques au foie gras” – discover Olivier’s special Scallop recipe for the Holidays. And for just after Christmas, January 6th is the King’s day cake: La Galette des Rois recipe.